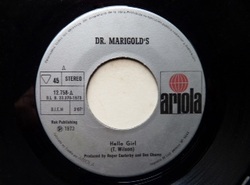 Dr Marigold's next and seventh single was 'HELLO GIRL'. It was to be the first release on the new label SANTA PONSA, PNS1A. When we first had the demo, the song was called 'make yourself at home'. Why the title was changed I am not sure, maybe on the strength of the words in the chorus. Exciting days ahead as the plan was to have an orchestral backing, a new experience for us. In the recording studio there were violin and cello players waiting for us. There we were, set up and playing along with these session players. The song was uplifted by the string section. Surely this would give us a good shot at the charts. Now we were ready to start on our second album, back at Audio International studios. The title of the album was to be 'HELLO GIRL'. Of the songs on the album, I have to name a few. A Bob Dylan song, 'SHE BELONGS TO ME'. ‘MUDDY WATER’, a much slower version of the single. 'LEAN ON ME’ the Bill Withers hit. 'WHAT THE HECK' (writing credit for all) which is also the B side of 'Hello Girl'. 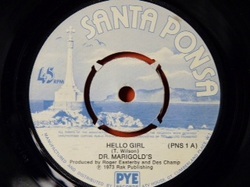 We again had lots of Radio play and of real interest our single 'HELLO GIRL' was released in many other countries. We were flown to Madrid by the Spanish record label ARIOLA to promote it. ARIOLA found us a nice hotel in the centre of Madrid and their rep took us out for a meal. We appeared on Spanish Radio to promote the record, leading to our TV appearance. This TV show was live, although I have to say we sang to the backing track which we took with us to Madrid. The show was a mixture of talk, fashion, interviews and music. The album has a great front cover which was photographed in a narrow courtyard off Wardour Street. I would have bought the album just for the cover. The model in the photo we were told, was a telephonist for the GPO which is now BT. We turned up for the photo shoot at around 6.am, braving the cold, but worse for the model. We had been together as a band and great friends for six years but one new thing was happening. There was talk of getting part time jobs to supplement the gigs which were beginning to dry up. This was the very last thing I wanted to do. There was one more record to make, so we thought let's try something really different, as apart from Radio & TV exposure, little success had been achieved so far. We felt we had tried almost everything. Our next single, our eighth was an instrumental. The title was 'MARCH HARE'. It was a traditional tune, a very well known one. We enjoyed playing the tune and it was a staple on our set list. Our version was powerful and seemed to be a rouser in the discos. It was now time to get some regular money. I used to spend my afternoons off visiting MECCA (not the religion) in Upper Street opposite the Union Chapel. Although this passed the time it wasn't very successful. I thought, if you can't beat them, join them. I got myself an interview at 'WILLIAM HILL' in Euston Road and I was surprised how easy it was to get a part time job. Now, for six years, I had not been used to taking orders from anyone and this was all alien to me. I turned up for my first day at 97 Essex Road, near the corner of Cross Street, knocked on that door and the first thing the manager said to me was, "Go and get a pint of milk, son". I bought the milk. 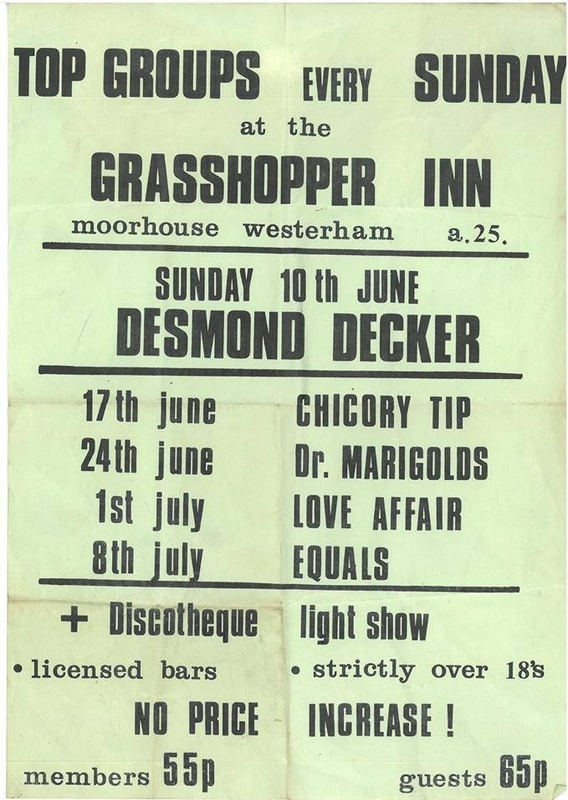 We played our last gig at 'THE GRASSHOPPER INN' at Westerham, Kent, keeping the poster as a reminder. In the aftermath, Dave (drummer) got the gig with 'GUYS AND DOLLS' through the Dominic Grant connection. Fred (singer/guitar) was called in to record one more track to finish the contract. The song was called 'LADY WITH THE SNAKE TATOO'. It was released under the name of 'DR MARIGOLDS'. It was Fred singing with session musicians, so really wasn't the original group. Some of the later songs were re-released on another new label called ROUTE. Bill joined a Country & Western band. I had a call from Bill in 1974 to say 'HELLO GIRL' had gone to Number 1 in South Africa on the 15th March 1974.